Chesapeake Yoga & Wellness is a mobile yoga studio that offers private group and one-on-one classes. As a mobile studio, Julie Phillips-Turner, owner of Chesapeake Yoga & Wellness, can travel to your location, or help find a location suitable for your class or event. Activities such as sailing, kayaking, biking, stand up paddle boarding, photography or even healthy cooking are also great for pairing with yoga for events or retreats. Contact Julie to create your own practice for yourself or a group. Email: Julie@chesapeakeyoga.com for more information. Founder of Chesapeake Yoga & Wellness in 2011, I discovered yoga and meditation in 1990, and found that it profoundly helped me to focus on studies and become a more organized and grounded person. In 2008, two family members were diagnosed with cancer, my yoga practice was my source for comfort, strength and mindfulness to handle life’s difficult moments. To me, yoga is a powerful therapy for both mental and physical well being, and not just a great physical workout. 20 years after first discovering yoga, I earned my 200 RYT certification - twice, and continue to pursue therapeutic yoga education and training that can help others with everyday issues - on and off the mat. My style focuses on developing mindfulness though breath awareness and proper alignment. I also mix various styles of creative movement, restorative techniques and powerful sequencing of poses so students realize the ultimate experience in relaxation and awareness in the moment. In addition to RYT certifications, my studies and certifications also include, Usui and Karuna Reiki Master; Ayurvedic Yoga Specialist (AYS) certification with Kathryn Templeton and the Himilayan Institute; Yoga for Cancer (Y4C) teacher certification with Tari Prinster; Para Yoga master courses with Rod Stryker; Boomer+ Yoga for seniors certification with Amy Kraft; Ashaya Yoga Therapy with Tod Norian; Yoga for Arthritis with Stephanie Moonaz; Restorative Yoga with Cindy Lee, and Yoga for Trauma and PTSD . As a Certified AYS, I have a deeper understanding of my client’s mental and physical needs though the practice of Ayurveda when developing a one-on-one specialized yoga program. As a Usui and Karuna Reiki Master I’m also able to help others reach a deeper level of relaxation and understanding of how important your personal energy is for maintaining good health. Certified as a SUP Yoga Teacher I bring my knowledge of yoga to the board to show students how to experience new ways of practicing yoga. A native of Maryland's Chesapeake Bay area, I grew up surrounded by the resources this great area has to offer, on and off the water. 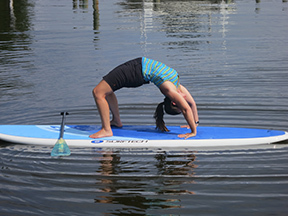 As an avid sailor, stand up paddler, kayaker, skiier, bicycler, writer and photographer -- I enjoy blending the mindfulness of yoga with my daily activities. Read a few of my articles on yoga that have been featured in the Baltimore Examiner, DoYouYoga.com and Chesapeake Healthy Lifestyles magazine.